So, I took the plunge and decided to spend some of my left over birthday money on an order from Glossier. Needless to say I was very influenced by many of my favourite bloggers who seem to love the fairly new brand. I decided to start slow and steady with this foray into skin care beauty by ordering the Haloscope + Boy Brow Duo - two products I've heard rave reviews about and was eager to try for myself. The first thing I can say is that while I like the comfort of shopping from my laptop, swaddled in a blanket on my couch, I still feel a bit nervous investing money in something I haven't had the opportunity to test out first. 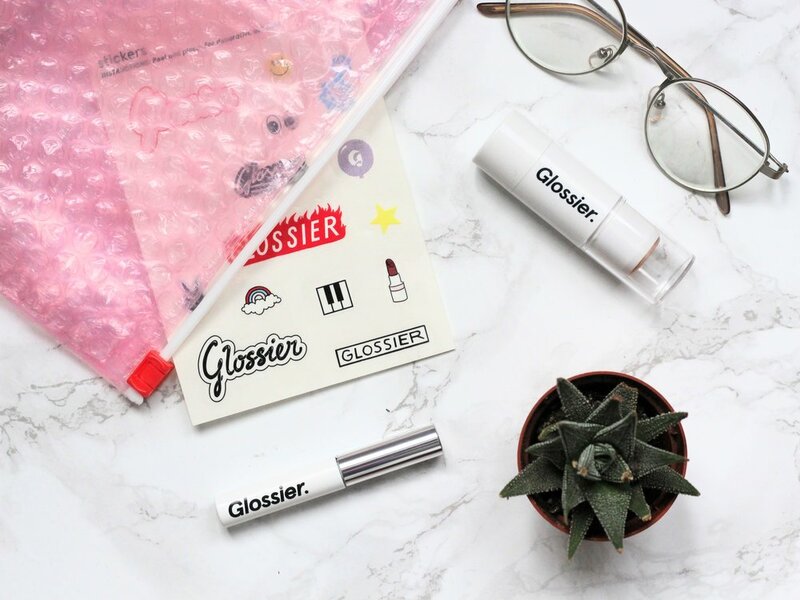 That's the catch 22 with e-commerce brands, I guess, but because of all the hype Glossier has gotten I felt a bit more comfortable trying it out. I am happy to report, though, that the package came extremely quickly, much faster than I was expecting and than what was said to be the delivery date when I made the order, so that's a plus! As for the actual products themselves, I've only had a week to really test them out. However, I've already noticed a few things that I like and dislike about each one from my initial impressions. I thought it could be useful for anyone else thinking about dabbling in the brand to read a slightly casual review by someone who's not that into beauty, but still enjoys it. Over the past two years I've become a huge fan of highlighter. There's something so fun about being able to bring glitter and sparkle into your every day life while still looking presentable and not like a child playing dress up. For the past year or so I've stuck with my MAC highlighter in Soft & Gentle, but I wanted to try out Glossier's stick highlighter and see if it was worth the hype. Pros: The main thing that drew me towards this product was how compact it is. I can easily toss it into my bag and run out the door if I don't have time to finish my makeup in the morning or if I feel like I'll need a touch up throughout the day. The idea of being able to just swipe it on without a brush or additional tool is a minimalist's dream. I also wanted a product that gave more of a glow rather than a sparkle to the skin, and Haloscope seems to do that very well. It looks natural and pretty. Cons: What I initially noticed when applying this product is how streaky it goes on the skin when you swipe it on. It needs a bit of a rub with your finger to have it look seamless, but that's a bit annoying because it rubs away some of the product as well as the foundation underneath. I was also hoping for a bit more punch to the glow, but all that it does is make it look like you've gone for a light jog around the block. I completely fell in love with my MAC brow kit when I bought it early last summer so I was eager to expand my experience with simple brow products. Boy Brow seems to be a product I continuously hear about so I thought I'd give it a try and see if it did anything for my fairly sparse brows. Pros: I was surprised by how waxy and thick the product is compared to the MAC brow kit, which is perfect because my brows seem to want to stick out at odd angles after a rough night's sleep. The brush also picks up a fair amount of product so it's easy to play around with and build up your brows quickly. Cons: The only issue I have with this product is that the brown shade isn't quite dark enough to really add volume to my brows. And I didn't want to order black, thinking that it would probably be too dark and make me look silly. If there was a shade in between the two it would have been perfect, but at least I'm still getting some shape and thickness while looking natural. What do you think about these Glossier products?